The Bible is very amazing. the English word “Bible” comes the Latin word, “bíblia” and the Greek word “bíblos.“ These terms mean, “The books.” The Bible is not just a book; it is a book of books. In my New Testament class we talked about our favorite book of the Bible. For me I like the book of John. Some mentioned Genesis, Romans, Psalms, and Galatians. There is no one correct answer because they are all top notch, but I think it is a fun way to learn about people when we understand their favorite book of the Bible. For some like Genesis, the Creation of the earth and the history of mankind. Others enjoy the Psalms because they are so easy to pick up and read; they are almost like a daily devotional. So why is John my favorite book? We all have a reason for our favorite books that we enjoy. I like the book of John because of the story of the disciple whom Jesus loves. Of all of the four Gospels, the book of John is the only book that talks about this disciple whom Jesus loves. Some believe that this person must have been a really good disciple to get such a name. They have this belief that because he has this title, and it would seem with a title like that, Jesus must favor him more than others. Mostly every other person in the Bible is said simply by their first or last name. When it talks about this person, “the disciple whom Jesus loves” it shows a particular emphasis compared to the other disciples. The New International Version (NIV) describes it as, “One of them, the disciple whom Jesus loved, was reclining next to him” (John 13:23). When we connect the dots with the other Gospels we can understand that this person is John himself. 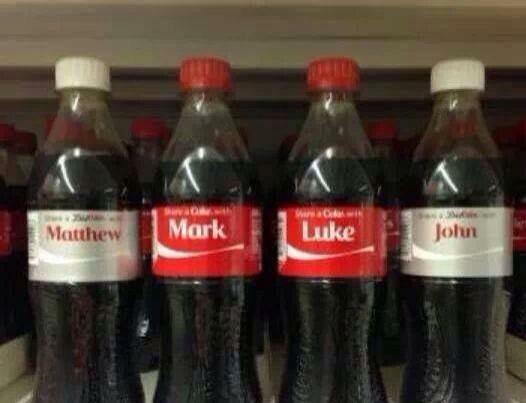 In Mathew, Mark, and Luke, they referred to John by his name, but when we get to John’s gospel we can see that his name is changed from John to the disciple whom Jesus loves. It was not that God loved John more than the others, it is that John personalized God’s love. John wrote down that God loved him personally. I can think of it like this, I am writing a journal about my day, and as I write I recall what happened. I write and say, “Brother Nick, Brother Joseph, and the Brother whom Jesus loves.” I am emphasizing the love of God in my life. I am reminding myself that God loves me. So when we understand the Gospel of John we can realize that John focused on God’s love for him rather than his love for God. Peter focused on his love for God. He told the Lord that he would never deny Him. He said, “But Peter kept saying insistently, “Even if I have to die with You, I will not deny You!” (Mark 14:31). Yet we see Peter deny Christ three times and John was there with Mary at the foot of the Cross. What is better to boast about your love for the Lord or the Lord’s love for you? The word Hebrew word for John is Johanan which mean, “Jehovah is gracious.” This truly is a book of grace. The translation Easy-To-Read Version (ERV) says, “One of the followers was next to Jesus and was leaning close to him. This was the one Jesus loved very much” (John 13:23). This translation says the one Jesus loved very much. God wants you to know today that He loves you, “very much” (John 13:23). That is my favorite book of the Bible, what is yours? Be sure to leave a comment and explain why you enjoy that particular book of the Bible! Yea, he had power over the angel, and prevailed: he wept, and made supplication unto him:he found him in Bethel, and there he spake with us ( Hosea 12:4 ) God was speaking with us. I’ve always enjoyed Romans and Ephesians. Both great books that I could read over and over. another UPlifting post – THANKS! !